Snow igloo with real beds inside. Nice atmosphere with led lights and white walls. 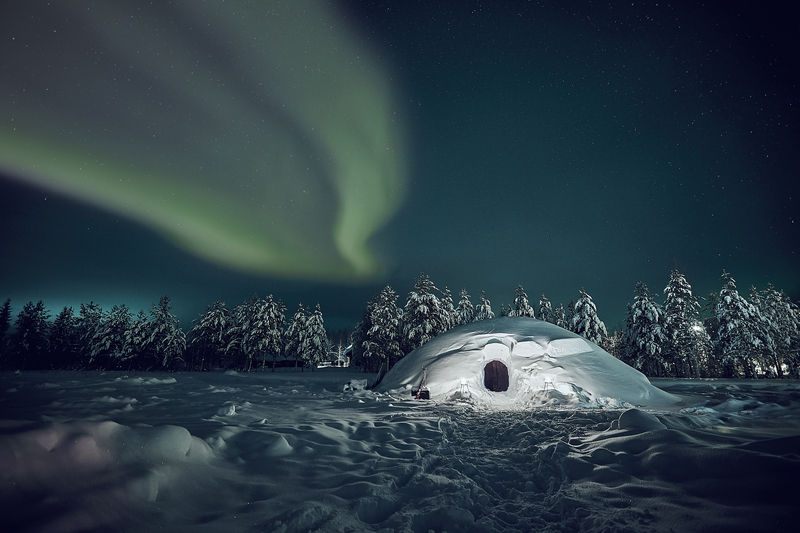 Outside the igloo is possibility to see northern lights if you are lucky. Come to Lapland and explore the wilderness. It’s always minus degrees’ inside the igloo. We provide warm sleeping bag but you should bring your thermos layers, warm hat, socks and cloves. Also headlight or flashlight is handy. Warm apartment available 24 h in case of cold feet. There is a warm inside area (base camp) available the whole night. In case of a cold feet or other reason you can sleep in one of the beds inside. We are located 10 km (10 min drive) from Pyhä Ski Resort which has a grocery store and several restaurants. Next to our place there aren't any places where to get something to eat so you might want to bring something with you or eat before arriving. There is a small kitchen available for the guests inside the base camp (microwave, fridge, coffee machine etc. We offer FREE wifi and northern lights (aurora borealis) alarm system!! Pyhä-Luosto National Park is the oldest national park in Finland. There are plenty of nice trails to explore also. Location is perfect for star gazing and searching for northern lights. Meet also the animals of the ranch. At nightfall crawl into a warm sleeping bag and enjoy the silence. Indoor area and toilet are open also during the night. Light breakfast is included.